I had toyed with the idea for a while of joining another force that had a mounted unit and chasing the dream - Lizzie Livingston has much to blame for this as I have been so jealous of the photos of her training and outings out with Avon and Somerset's mounted division! The only downside to this was that I would have to join as a beat officer first and then hope a place came up to move into the mounted section as there was no guarantee. Gloucestershire was offering a position on the unit straight away and I was interested by the county as it is a similar set up to Hertfordshire in that there is a good mix of rural and urban policing. I kept everything very quiet as I was not sure I would be lucky enough to score a job position but amazingly I was picked as one of two to join Gloucestershire's new mounted unit. First things first, a 12-week training course stood before us both down at Imber Court alongside the Metropolitan Police. Walking into that yard took me back 10 years ago when I was talking to the man who ran the Met mounted, so it all felt a bit surreal. We are 6 weeks in now and it has been amazing - I cannot believe my job is to ride horses doing the career I love! It all starts to sink home when we go out on the streets in uniform or get geared up in public order protection clothing and I cannot wait to get going in Gloucestershire. 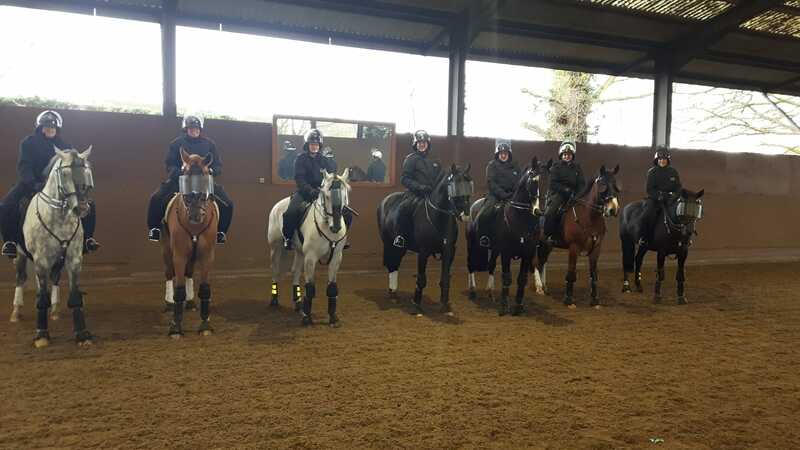 We have some lovely horses to ride that range from schoolmasters and ex-police horses to totally new to the job horses, so we are having lots of experience riding all types. We have assessments every 4 weeks where we must present our sparkling clean horses in full patrol kit, present a super clean stable and complete a riding assessment. We also have knowledge checks every other week and there is a final assessment at the end of the course that determines if we pass or not. It's all a little nerve-wracking but it helps that this is something that I want so much to happen as well as revising a topic I'm interested in! I'm hoping to keep you all up to date with my progress and then fingers crossed my experience over in Gloucester - I'm also hoping to get some new recruits involved in Forces Equine from over there too! It's a big upheaval to move myself and my lovely horse Trusty to the other side of the country but it's all going to be worth it. I cannot wait!